I don't think you can complete a Melbourne travel series without mentioning the food, though the shortness of our trip and public holiday meant that we couldn't quite manage a food crawl like we did last time. And, as much as I enjoy the adage that 'life is too short to have a bad meal', I think it's important to remember that 'bad' is subjective, and that Gokuboso Pocky (now $2.80 at Daiso, which is the cheapest you'll find them in Australia) while watching a tennis game or 1AM migoreng can be just as satisfying in the right circumstances. Crepes, to me, strike the perfect balance of a carb hit without the heaviness of thick dough but I've always been ambivalent about the ones you find at festivals, which basically involve charging an exorbitant amount just for Nutella. La Petite Creperie is - true to name - the small, sit-down branch of what appears to be a series of crepe stalls all over Melbourne. The storefront on Hardware Lane is unabashedly French, from its waitresses speaking in rapid-fire conversation to the vintage French melodrama playing from a tiny TV mounted in the corner of the store. My galette (savoury crepe) was solidly packed like an envelope, with cheese, mushroom and tomato, and, with its slightly coarser texture that suggested the use of buckwheat flour, made for a pretty substantial lunch. However, it was our dessert crepe of salted caramel, cinnamon apple and walnuts that stole the show, topped with a rapidly melting scoop of ice-cream. It was - crucially - not overly sweet, which is always a good sign. Chin Chin is modern South East Asian cuisine personified - brightly lit interior that's retained its federation building rustic, playful fonts and all the stylish hipster trappings. The price point is in the medium range but worth it for a satisfying meal or occasional treat. And hey, can you say no to playful design? I was impressed that the Pad Seuw of Braised Wagyu actually used proper cuts of Wagyu meat, which had the the slightly fibrous and rich, beefy taste that almost tasted out of place with the rest of the dish (if only because we are used to the rubbery, uni-student-cheap-takeaway option). The Pad Thai Noodles was also a familiar, solid dish with great noodles but I was not as fond of the Wok Fried Spanner Crab Omelette, which seemed slightly underseasoned. My main dish, the Caramelised Sticky Pork, resembled a pork belly dish but Chin Chin seems to have understood the inherent angst of trying to evenly serve yourself all the components of a pork belly (skin, meat, fat) without just shoving the entire thing in your mouth, and come up with a solution. Encased in a crisply fried casing of... skin (or something that was crispy and delicious), the dish consists of blocks of compressed pork meat that tasted like someone had evenly mixed all the components of a pork belly into a juicy block that struck a pleasing balance of meat and fat. It's all drizzled in a sweet, fairly concentrated vinegar with just a bit of a chilli bite to it. I thought it was a great dish, though I would recommend it be shared or eaten with rice as it's quite rich. We also had to tick off the Lygon St trope and get some solid Italian food - and Tiamo turned out to be a good choice. The Quattro Funghi pizza was - true to theme - a study in a huge variety of mushrooms. I'm going to guess that one of the key mushrooms used was chestnut or Slippery Jacks (a wild mushroom) because it had quite a strong, unusual flavour. I quite liked the taste but it can be a bit of an acquired taste. The Salsicce pizza flavours were slightly more standard, but you really can't go wrong with sausage, cheese and rocket. 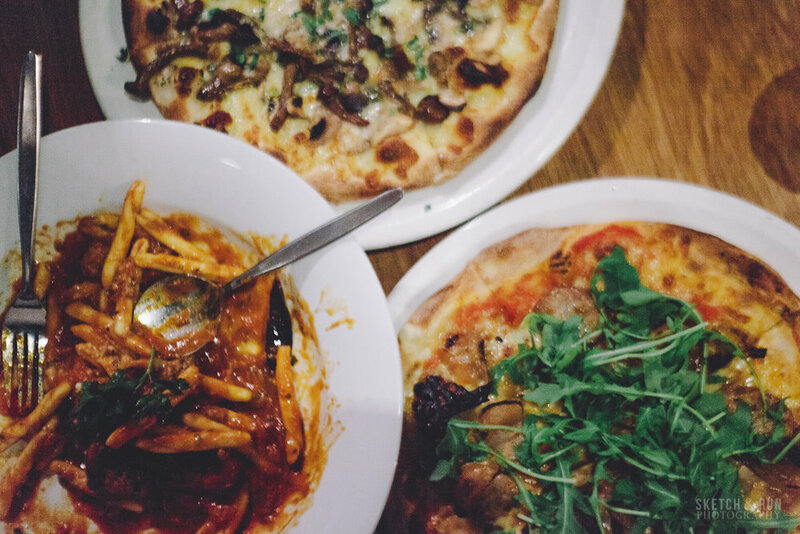 Tiamo's pizza dough is hand-made and it really makes a difference the moment you bite into the crust, which is light and airy, as well as soft. I will throw out a disclaimer that the Maccheroni della Zia pasta does not exactly look appealing here, but that was because we were so hungry that we had already started demolishing it by the time the pizza arrived.Hey, sometimes, it's not always about the Insta. This dish was a huge explosion of vivid, tomato flavours, accompanied by very soft pasta. I wasn't a huge fan of the pasta's texture, especially paired with the soft eggplant but I loved the flavours. I wish I had spent a little more time at Captains of Industry, but I had to bail because I was worried my travel buddies were starving and locked in our apartment (it's a long story). This cafe space is located in a hard-to-find nook off Hardware Lane, and embodies the whole rustic, repurposed factory space vibe of your typical hipster, Melbourne eatery, while still being a relaxing, almost homely space with a great view out to one of Melbourne's busiest streets. The space also houses a barbershop, and an interesting assortment of designed items, like leather goods and jewellery. The Magic Mushrooms (aka. mushrooms on toast with goat's cheese) is a safe option for all the 'shroom lovers, and is sure to be very filling. My friend and I ended up ordering the same thing so my experience was limited to this one dish. I would love to come back though! You have to love the effect of food blogs and publicity nowadays. Word to the wise: Do not attempt to enter on a weekend. However, if you're lucky enough to find an Airbnb like ours, you can attempt the trek early at 9:30AM on a Wednesday, before your flight. You might end up only waiting 15 minutes if you're lucky. To the question of whether Hardware Societe lives up to the hype and, more importantly, the wait, I would say that it boats undeniably good food that pushes gently on the envelopes, but did not necessarily blow my mind enough that I would endure an hour-long wait, as some of the other patrons were doing when we first wandered past. The portions are very generous so three dishes between four was definitely enough for us. I would have loved the Baked Eggs (Deux) in winter, where the heaty, filling warmth of the eggs would truly have the chance to shine. The dish is designed to be mixed into a gooey mass and heaped onto your bread and, to that end, it works beautifully. Despite the cafe's predominantly French menu, the mix of spices also reminded me a little of Spanish-inspired flavours to me, especially in the piquillo peppers. This way of cooking egg is definitely something I haven't seen on many brunch menus, and, in allowing you to experience the various stages of 'cooked' egg, is something that will definitely appeal to egg-lovers. Speaking of rare menu items, I think I liked the Lobster Benedict most, based on the novelty factor. The lobster meat, combined with a subtle lemon hollandaise transforms this dish into something summery and light, a mix of subtle flavours rounded off by the sweet brioche. The dill is essential to the flavour of the dish and pairs well with the asparagus to offset the more lemon-y acidic flavours with an unabashedly vegetable taste that you either hate or love. We were, unfortunately, disappointed by the crackling on the Pork Belly and Fried Eggs, which was the only minus in another pretty cracking dish (though, with its richness and abundance of deep frying, this is definitely not for people wanting a light brunch). The pork belly itself was cooked tenderly and melt-in-your-mouth. The bulk of the dish's substance comes from the croquet, which boasts a flavour I can only describe as 'cheesy bacon'. The apple chutney actually had a bit of a spicy kick to it, which enhanced the dish.